Uniform: Set includes jacket, pants, hood, mask and hand/forearm cover. Available in black only; sword pictured sold separately. 100% Cotton Boots: Secure footing and designed to be silent! Black canvas upper with non-slip upper soles and adjustable Velcro closures. Women order 1 size smaller. Chucks: 12" long, foam padded ball bearing swivel, chrome cap and chain. 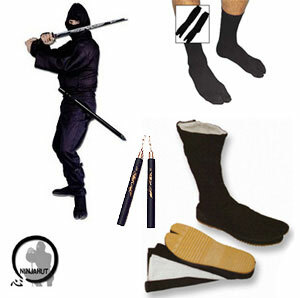 This chuck is great for the student that wants to increase his speed Socks: Ninja Tabi Socks are made of black 100% nylon and have the same split toe design as the tabi boots. One size fits all.